While diving in water seems an enjoyable outdoor activity, walking on water might be rough on your feet. When diving in water, you will need to have your dive boots on to protect your feet from water elements. Scuba diving boots are a pretty essential gear to keep you comfortable and safe in the waters. With a wide range of dive boots having different features and styles, selecting the best for your diving might be difficult. In this post, we are making the selection process a lot easier by looking at the best dive boots to buy this year. Read our dive boot reviews and choose a boot that best suits you. 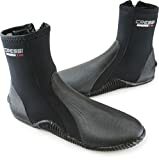 These are pretty simple 2mm neoprene nylon boots for easy movement in the water. They are a safe choice with a vulcanized rubber sole to give you maximum protection. The boots are lightweight and will not weigh you down in water. They have been blind stitched and glued to prevent water from leaking. A tall protective heel further enhances protection in the water. The Neo-Sports brand is a leading choice in the dive boots industry, and you will never make a wrong pick. 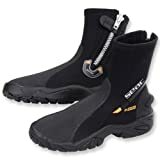 These are excellent thick neoprene dive boots with a varying thickness of 3mm, 5mm and 7mm to suit different water conditions. The boots feature a rugged construction and an easy on/off zipper. The back of the zip features a waterproof WEB to prevent water soaking. Overall, these are quality dive boots with a puncture resistant boot that is glued and sewn. These are among the leading dive boots currently used by master scuba divers. They are a top-quality selection operated and owned by PADI. The boots feature a durable 3mm neoprene thickness to offer great protection. They insulate heat and ensure you’re warm at all times when in water. A rear notch helps secure your fin while a side strap ensures you easily fit and remove these boots. Overall, these are extremely high-quality boots retailing at very affordable prices. The Mares dive boot is another leading boot in the dive industry with amazing features and sturdy construction. These boots feature a double neoprene lining for excellent insulation and protection. They are a great choice with a side zip for easy donning and doffing saving you time. A further heel reinforcement helps prevent water from soaking into the boot. The sole is made of rubber for better traction, lightweight and maximum protection. This is one of the oldest diving boots on the market since 1946. It is a quality pick with great features that allow for easy use, donning, doffing and comfort. The boots feature an ultra-durable tall neoprene which is ideal for any water sports. For added durability and strength, the boot features a toe cap and rubber heel. Overall, this is a very flexible dive boot with the nylon II neoprene. A zipper closure ensures you easily put them and remove them. The Phantom dive boots are quality boots sewn from the warm and durable 3mm nylon II neoprene material. The boot features a versatile rubber sole that offers excellent feet protection. A toe-slip design adds the boots durability and strength. This boot is pretty durable and features a grippy sole for easy traction in the water. It is an excellent selection for keeping your feet warm in the coldest water conditions. The Mares dive Trilastic dive boot is an exceptional watersports boot with high control engineering. It is a robust boot with a versatile design that offers users the highest control when in waters. The boot features a superelastic ankle area to offer you flexibility when diving in waters. It is a quality boot made of the 5mm trilastic for maximum insulation. 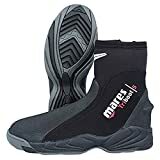 This Mares dive boot is highly recommended, and you can buy with confidence knowing you will get the full value for your money. The Sea dive boots are a premium quality pick with one of the best stretches giving you maximum flexibility. These boots stretch up to 250 percent more than most standard neoprene boots. They also feature a durable Velcro zipper flap that protects your feet and ensures it remains inside the boot when diving. For added durability, the boot is glued and blind stitched. They also feature a molded heel air bubble that ensures stress on the feet is reduced. These are flexible rubber dive boots with a laminate guard that helps protect the fin straps and foot pockets from abrasion. They are an excellent addition to your dive gear with heavy duty zippers that allows for fast entry and exit. The boots also feature polysuede entry pull, zipper lock and strap stop. They come packaged in a drawstring mesh bag for easy transportation. The Seac Basic HD dive boots are another excellent choice with a thick 5mm neoprene lining to keep the feet warm and protected. The boots feature a semi-solid sole that ensures great traction on water surfaces with ease. There is a further instep that is protected by a soft padding to make them feel comfortable. This boot is easy to put on and remove due to the interior nylon lining. Overall, they are a quality choice with excellent reviews. Next time you want to head diving in the waters, get your dive boots ready by choosing one from the list above. 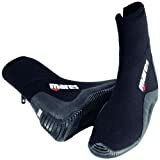 These are the best dive boots on the market currently with a wide range of features to get enjoying your diving. Click here to read more about the snorkeling sets.